I have to admit it: I work very hard to be an effective listener. I know this wasn’t always the case, because like so many others, I went through years when my parents were constantly asking, “Sharon, are you listening?” or “Sharon, did you hear me?” Oh yes, in my youthful naïveté I’m pretty sure I wasn’t even aware of their question! Good listening skills leads to better customer service, greater productivity with fewer mistakes and a more creative and innovative working environment. Research has found that by listening effectively, you will get more information from the people you manage, you will increase others’ trust in you, you will reduce conflict, you will better understand how to motivate others, and you will inspire a higher level of commitment in the people you manage. After all when we are young we tend to think the world revolves around us, with our needs and wants of paramount importance. But it takes the maturity that comes with age to make us realize that isn’t true. Flash forward to today, focused listening is something I do because listening really matters. Recognize the importance of having good listening skills. It matters at work and among friends and family. I found that the more “tuned in” you are the more you are able to actively participate and contribute. I began to not just get something out of listening but also to give as well. Be patient. This does not come naturally to me, but it is an important component of effective listening. I try really hard not to jump to conclusions before the other person finishes speaking. Also, one can’t speak and listen at the same time, so I trained myself to listen carefully to the person speaking before answering or offering my opinion. Pay attention to live conversation. For me this is the biggest challenge. We live in a hyper-connected world and must deal with the beeps and chirps that emanate from all of our electronic devices. The key is to place my technology in my bag so I can give someone my undivided attention. In order to listen you must be present both physically AND mentally. There really is no such thing as multi-tasking. Listen carefully. Not only to a speaker’s words but also to their non-verbal message. I find I can get a complete and honest picture of what is being communicated if I put together the whole “picture.” A person’s tone of voice and gestures can completely contradict the words that they’re saying, and you have to be ready and willing to pay attention to both. Perhaps the most important thing that helped me learn to be a better listener simply came with owning a business. It’s one of the building blocks to success. 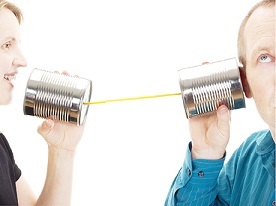 I realized that to have substantive and meaningful business and personal connections, I needed to be an active and effective listener. It’s a skill that has served me well all these years. Excuse me, what did you say? symmetry because printing isn’t always black and white.